Location — Taormina is a small picturesque town located on the east coast of the island of Sicily, Italy. It perches high on the cliffs above the Ionian Sea, which is luxuriously warm and has an extremely high salt content (better for floating!). Population — Approximately 11,000 permanent residents call this historical village home. Claim To Fame — Considered to be the most beautiful town in Sicily, Taormina has been a hub of art and trade back to the time when Italy was ruled by the Greeks (around the 5th century BC). Now frequented by the European jet-set, it is the type of Italian town you see in the movies, and is packed with restaurants, cafes, parks, and boutiques. One of the most stunning sights is the Teatro Greco, an ancient Roman amphitheatre that overlooks the sea and — on a clear day — gives you a view of Mt Etna. Oh, and did I mention the AMAZING beaches! Orientation — The town centre is located on the top of a hill (you must take a bus or a looonnnggg walk to get up to it). The main road, Corso Umberto I, runs through the whole town. Getting Around — Walk, walk, and walk! This is a tiny little town so the easiest way to get around, and take in the gorgeous views, is to use your own two feet. In order to get down to the beach you will need to take a cable car OR go on a nice long steep hike (trust me, take the cable car). Getting There and Away — If you are coming from the mainland, the easiest thing to do is to take the train. How do you get to an island on a train you ask? On a boat of course! The Italians have ferry boats that line up with the tracks and allow the trains to drive right on, meeting up with the tracks again on the island. You will need to catch an Interbus from the train station into town. If travelling around the island the best way to go is by bus. Where To Stay — Because Taormina tends to attract a wealthier crowd, there are many expensive hotels, pensiones, villas, and rooms for rent. But, the budget conscious need not dismay, there are also a few cheap hostels and even a campground for you! Try and call ahead if you are travelling in the high season however, as you can imagine, these less-expensive options fill up fast! What To Do — Relax at a cafe, ride the cable car down to the beach, suntan, take in the majestic view of Mt Etna at the Teatro Greco, hike up the cacti speckled cliffs overlooking the sea, wander through the historic city centre as the sun sets, indulge in a delicious meal at a local restaurant... REPEAT! How I Found It — While travelling through Italy, my travel buddies and I ended up in Taormina largely because it was the lest expensive ticket to buy at the train station. Our ultimate goal was getting to Mt Etna (a town over), but we decided to stop here in order to save some money. Intending to only stay for one night, we ended up adding a few more because of the chilled out atmosphere, a great hostel, and the gorgeous beach! The Teatro Greco was once solely used for gladiator combat and was where Woody Allen filmed the Greek chorus scene for his film Mighty Aphrodite. Trust me, travelling can test ANY relationship. Whether you are planning on travelling with your boyfriend, best friend, sister, father, or a new acquaintance, there are a few questions pre-travel that you must ask any potential travel buddy to make sure you both have an amazing trip. 1. What is your budget? How much do you want to spend on food, fun, etc...? You need to know that you are on the same page in terms of what you are going to spend during your trip. If you are planning on travelling on a shoestring and eating from markets or street vendors while your travel buddy is expecting to have restaurant meals three times a day, there will be more than a few problems. 2. Do you prefer to plan in advance or are you someone who likes just winging it? If you need to have your days scheduled, and stick to the schedule, in order to have a good time, then you need a travel buddy who will be the same. On the other hand, if you are someone who likes to just wander and see where the day takes you, having a buddy who wants a strict schedule will cause a lot of conflict. You need to know if you are compatible or at least willing to strike a balance in how you plan to spend your days. 3. Do you prefer that we spend all our time together, or are you comfortable with us separating to do our own thing every once and awhile? To me, this is the most important question. I enjoy doing things when I travel that not everyone likes to do — I'll hike to the top of a mountain on a sweltering hot day just to catch a glimpse of an ancient library located at the top or spend hours wandering through an art gallery. And I want to be able to do those things without having to worry that the person I am with is enjoying themselves too. Sometimes the easiest thing to do is to split up for a day, an afternoon, or even just a few hours, so that you can both have an experience that the other person wouldn't enjoy. But, you need to know that your travel buddy is up for that and that there will be no hard feelings either way. 4. What type of accommodation are you picturing? Hostels? Campgrounds? B&Bs? Hotels? Not only the type of accommodation, but the area of the city you are wanting to stay in is also important. (Prices tend to get higher the closer to the centre of a city you get — though that's not always true if you are willing to stay in hostels). Are you both okay with the co-ed room in a hostel dorm? Are you looking for a room for two at a B&B? Or, are you both wanting your own room at a hotel? Make sure you know where you are both expecting to lay your head before packing your bags! 5. What activities or attractions are an absolute must-see for you and what are you flexible about? You are headed to New York and you will give a limb to get to the top of the Empire State Building — even if you have to stand in line for the entire day. Your travel buddy needs to know that, because if that isn't on their to-do list, this could lead to an argument. When I am headed on a trip, I always let my travel buddy know what my must-do things are and if hers/his matches up then we do them together. If not, see #3 above. I have dreamed of dropping everything, packing my bag, and running away to Bali to become a Scuba Dive instructor for years—who hasn't—but for my friend Shannon, it isn't a dream, it's his reality. Shannon on dry land–a rare occurrence these days! The Anthrotorian (A) : Where was the first place that you scuba dived? A: When did you know that you wanted to become an instructor? S: I never wanted to be an instructor actually, but the first time I dived in Nah Trang I knew that i had to find a job where I could do this and make a living. A: How long did in take you to become certified? S: Open water, advanced, and rescue courses took about 40 dives and I did them in Nah Trang, Vietnam; Sihanoukville, Cambodia; and Koh Tao, Thailand, respectively. Then it took 2-3 months to take the Dive Master (DM) course. I worked as a DM for the first year, and it seemed to be a good diving job. I had to take the next step and become an instructor. This was a 3 week course. A: Was it easy to find a job? S: There are a lot of jobs in the diving industry. If you are certified, and willing to relocate, it is not hard to find one. Most of the jobs are seasonal however. A: Realistically how much can you make as a scuba diver? S: A good job would pay about $2000 per month and will often include room and board. Of course, there are exceptions. A: Walk me through a day in your life. A: What is the craziest thing you have seen? S: Craziest.... hmmmm.... Dugong (sea cow) or mola mola (sun fish). Maybe humpback whales or the sun rising from the top of Mt Kilimanjaro — I can't answer this one!!! Lembai Pygmy sea dragon was special too. A: Where is the most amazing place you have dived? S: Another difficult question! South pinnacles, Protea banks, South Africa are up there! Seeing over 1000 hammerhead sharks in 1 single dive. But Castle rock, Komodo, Indonesia, has the healthiest corals and the most fish I have ever seen! When they all started to eat each other it was like being in the Blue Planet series! S: Getting caught in a down current while diving, bungee jumping in South Africa, skydiving at home when I was 14, and crossing the road in Hanoi, Vietnam! A: Will you do this forever? S: I would think not, but would like to think i'll always be around water, or living next the sea if I ever should "settle down" — whatever that means. A: If you weren't a scuba instructor what would you be doing? S: Most probably still living back in Australia, headed towards running my own electrical and refrigeration contracting business, 2 1/2 kids and a white picket fence. A: Worst part of the job? S: The day of the charter starting and the chaos of having to get food, supplies, and guest together in time to leave. A: Best part of the job? S: Easy! When I see that look in a guests eyes, almost like they want to cry with joy, and they tell you "that was my best dive ever!" S: Fruit salad with muesli, yogurt and honey. A: What is the last book you read? A: Where is the last place you travelled? S: Blue, when the water's green the visibility is bad! A: If you could meet anyone alive in the world who would it be? A: Where do you feel most like yourself? S: Can't decide yet, when I find it, that's where I'll stay. For sure it's nice below the sea! You can find Shannon in Komodo, Indonesia where he operates a unique diving business called Current Junkies. It is a new and original concept in diving, that specializes in drift diving and strong current diving. Guests stay on his outfitted boat for 5 days which allows them to do dives further out in the ocean. The aim is to find Blue Planet-like dives for all of his guests! Located on the east coast of Sicily, Mount Etna is one of THE MOST ACTIVE VOLCANOS IN THE WORLD (! ), and is two times the size of the infamous Mount Vesuvius (the volcano near Pompeii). Deciding to risk it for the sake of adventure, my friends and I left the safety of our hotel room in Catania early one morning and, after a sleepy bus ride, found ourselves at the base of this iconic force-of-nature. The barren landscape was broken only by a few small cabins selling snacks and kitschy souvenirs. I picked up a book about Etna to flip through and learned that the city we were sleeping in was once covered in lava during an eruption that lasted for 122 days — great. There were sturdy looking 4WD vehicles lined up, ready to take brave tourists the 2,900m to the top. Even the cable car, usually only running in winter for skiers, was working. With both of these options before us, we logically chose the most difficult — the three hour trek through the eerie lava-scape littered with fissures and old craters. The slopes of the steep mountain were covered in thick layers of porous rock and ash that made for unsteady ground. Stumbling at one point, I reached for the rock beneath me and was surprised to feel how hot the rocks were. Heat from the lava below was literally emanating from beneath my feet. The closer we got to the top, the colder the air got (there was even piles of snow up there! ), but the heat coming from the ground made it bearable. Smoke, pouring from the one of four live craters that we were hiking towards was obscuring the blue sky, making the landscape even stranger, more alien. There is no way to describe the feeling of walking along the lip of an active volcano and staring down into a lava flow — the power of nature is magnificent. After chatting with him for a bit, we climbed back on the bus and headed home — sore and with a newfound respect for Mother Nature. For more information on hiking, tours, skiing, and the state of the volcano, visit the Etna Administrative website here. Packing a carry-on for a trip involving air travel isn’t rocket science, but you would be surprised how many people forget to throw even the smallest (but often the most important) things into their bag. The first thing to remember is that your carry-on can't be more than 10kg. Though you can often sneak through with a heavier bag (I do it all the time), there is always the risk of getting caught and having to pay to check your heavier items. Liquids, gels, lotions, etc. in containers larger than 100ml/100g/3.4oz are NOT permitted, so assume that when I mention these items I am referring to the small version of them. Though many people consider their carry-on to be what holds their source of entertainment or simply a vessel to throw all of the things that they could not fit in their checked luggage in, I approach it in a slightly different way. To me, the carry-on is your survival kit in case your luggage gets lost. It needs to contain everything that you would need to survive a full day and even a few nights at your destination. Location — Jeju-do (‘do’ means island) is a large, subtropical volcanic island located 85km off the southern tip of the Korean peninsula. Population — This small island has a population of 540,000 permanent residents, though this can as much as double during the summer. Claim To Fame — Considered by Koreans to be Paradise, Hawaii, and Disneyland combined, this is THE honeymoon location for newlyweds. The island contains South Korea’s highest mountain — a 2,000m high extinct volcano — long sandy beaches, impressive waterfalls, extremely rare lave-tube caves, and delicious oranges. 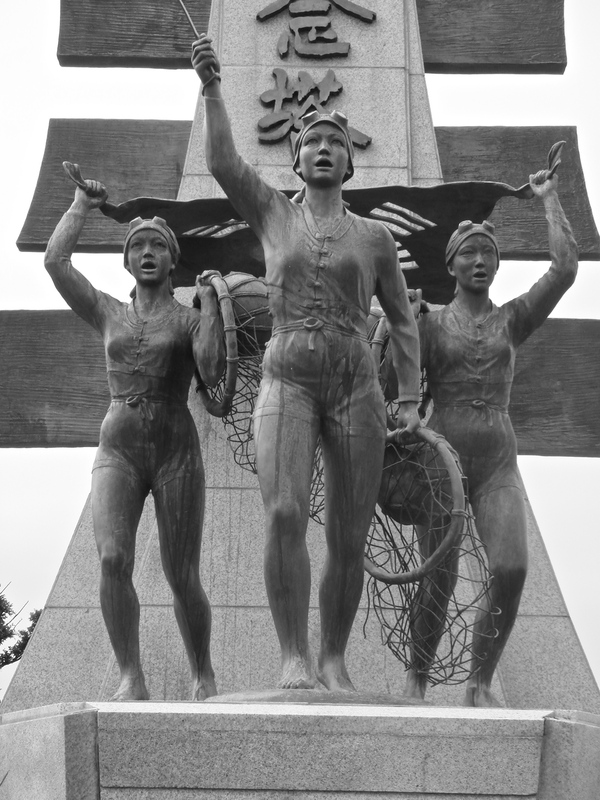 Female divers, or haenyeo, are found on many of Korea’s islands, but are the most famous on Jeju. These divers use NO scuba gear and are able to hold their breath for a full 2 minutes to allow them to reach a depth of 20 meters! At their peak in the 1950s, there were over 30,000 haenyeo, but now there are only around 3000 of these impressive women left. Orientation — The island is about 200km around and is divided into four quadrants with the lush Hallasan National Park in the centre. The southern side is where most of the attractions, and resort-like hotels are located and so is the most tourist-friendly. Getting Around — There are buses that can take you to all of the major tourist sites, and renting a taxi for the day is relatively affordable. Your best bet (especially in the off-season when taxis and buses aren’t as numerous) would be to rent a car from one of the rental agencies at the airport. Just MAKE SURE YOU DON”T SPEED!! There are speed traps EVERYWHERE — trust me, I got a ticket. Getting There and Away — There is a small airport on the island, but you can only fly in from one of South Korea’s major cities. Busan or Seoul would be your best points of departure. You can also reach the island by ferry, but the sea between the mainland and the island tends to be really rough, so unless you have an iron stomach, I suggest flying. Where To Stay — Because Jeju is a major tourist destination, there is no lack of hotels, guesthouses, hostels, and resorts. Whatever your price point, ensure that you book ahead of time, and count on prices raising on weekends and in the summer months. What To Do — By far, the most unique thing to do on the island is exploring the world’s longest system of lava-tube caves. The system in 13.4km long with a height and width anywhere from 3m to 20m. It is damp, incredibly humid, rocky, cold, and dark in the tubes, but what makes them so unique is the fact that they are relatively unregulated. Unlike attractions similar to these found in the Western world, the tubes don’t have roped-off areas, walkways, no-go zones, or park rangers that keep tourists from going somewhere they shouldn’t. Don’t get me wrong, I am NOT advocating doing something to risk your safety, all I am saying is take advantage of an experience that will let you feel like an adventurer, discovering something for the first time. There are shrines and museums throughout the island, and no visit to Jeju could be complete without hiking up to one of the 360 volcanic craters that can be found throughout. These craters are incredibly lush and give hikers an amazing view of the surrounding ocean. How I Found It — When I was living in South Korea, my brother and sister came to visit me for a week. While they were there, we decided to check out this amazing island that everyone kept telling me about. We took a flight from Seoul (it was only about $60 each) and spent 3 days exploring the island. I was there in the off-season (it was not yet bathing suit weather) and, though I wouldn’t call it Hawaii, it was beautiful, interesting, and well-worth the visit! I am constantly asked for advice on when the best time to travel is and my answer is always the same — the shoulder or off-season. This tends to fall outside of the summer months and in between holidays, when the weather is colder, the days a bit shorter, and there are no popular festivals filling the streets. While you may have to wear a few extra layers while exploring, traveling during this time of year has A LOT of benefits. There is nothing that screams ‘tourist’ more than runners, shorts, a brightly coloured T-shirt, and a sunburn. Not only that, if you are from a dry country and are touring somewhere humid in the middle of summer, you are sure to be sweating as you sit in a crowded subway or walk down sunny streets. (Trust me, I’ve experienced it). If you are travelling in the off-season, you will more likely be wearing clothing that helps you blend better with the locals and will be more comfortable in the cooler climate. If you live anywhere that is considered a ‘tourist destination’, you know how annoying large, loud groups who don’t look where they are walking and force you to wait in line for a coffee can be. In the off-season, having had a break from the onslaught of travellers, the waiter in the cafe will be more patient while you struggle to order a coffee in his native tongue, and shop owners are sure to be kinder. Scam artists go where the business is, and in the off-season, the people trying to charge you $20 for a walking tour to nowhere or $30 for a plastic statue of Michelangelo’s David are nowhere to be found. Without a crowd to hide what they are doing, pick-pockets are also sure to keep their distance. Not only will your accommodation be almost cut in half, the price of meals, admission, taxis, souvenirs, tours — pretty much EVERYTHING — will be cheap, cheap, cheap! I stayed at a resort on the beach in the Algarve last November for 30% of what it would cost during the peak season. It was still warm enough to suntan during the day and it was lovely to have my pick of spots on the beach! Imagine standing in front of the Mona Lisa completely alone, taking a photo of the Colosseum without a single person in it, or walking into a temple at Angkor that not a soul is in but you. All of these things are possible (I promise, I have the photos and experiences to prove it!) if you embrace off-season travel! Subscribe to The Anthrotorian's Newsletter.